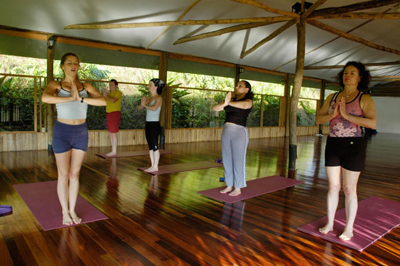 If you are looking for a place to take an excursión, workshop or Yoga class which has a unique rustic elegance style where good taste and nature stand out, Sueno Azul is for you. 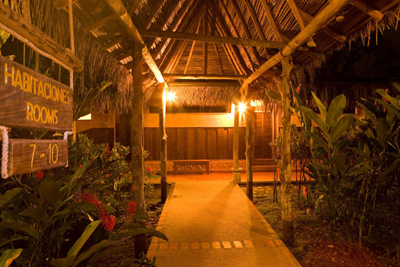 Unlike traditional hotels, Sueno Azul is the perfect blend between nature and comfort. Though it has been designed with a rustic touch, Sueno Azul has all the modern facilities you have been craving. It has 64 elegantly decorated rooms. Each and every room has an excellent panoramic view towards lakes and mountains. These full furnished rooms have Queen beds, ceiling fan or air conditioning, private bath with hot water, hair dryer, safety box, and a private terrace. Its proximity to Braulio Carrillo National Park and the mighty rivers that surround it, make this place a haven for lovers of nature, tranquility, equestrian activities and adventure sports. 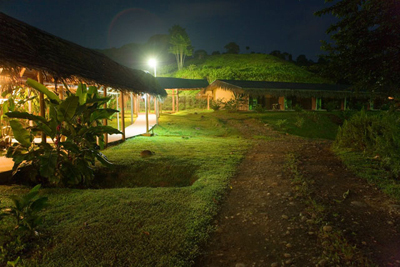 Sarapiqui is known as the new nature destination of Costa Rica and our hotel is considered the best in the area. The restaurant “EL CORRAL” was built in the former stables of the Treasury. Enjoy our traditional Costa Rican and international cuisine in a pleasant atmosphere while admiring the stunning scenery. You can also enjoy our restaurant and bar service on the terrace of “La Casona”, built over a century ago. Your privacy and proximity to nature comprise an environment full of positive energy giving you a profound feeling of well-being and deep revitalization. They have a fully equipped yoga studio. More than 100 yogis can do yoga in this beautifully decorated modern yoga center. This yoga studio is the result of their commitment to spiritual and corporal well-being. This studio has a fabulous view which allows you to absorb all of the positive energy that nature has to offer. As the source or rejuvenation they use the Awapa Spa which, with its ample variety of treatments including message, wraps, facials and alternative medicine, will help to re-cooperate your natural vitality and improving your quality of life. The products used in the spa are made with plants from our own botanical garden combining their medicinal properties. It is the perfect place to relax with family or friends, and rejuvenate your body, soul and mind. They aim to offer clients an unforgettable experience, by offering them spiritual and physical harmony by combining Nature with Comfort.